We are all on some sort of budget and when it comes to feeding our family, we need to find budget friendly family meals. Angela, from WriterMom’s Blog recently asked me to participate in her recent project. I am joining 14 other bloggers all posting budget friendly recipes and all linking up together. What a great way to get a few new budget friendly meals in our arsenal. I was recently at our Sam’s Club and saw a big bag of colored sweet peppers on sale. Growing up we had stuffed green peppers quite frequently but I had yet to make them for my own kids. 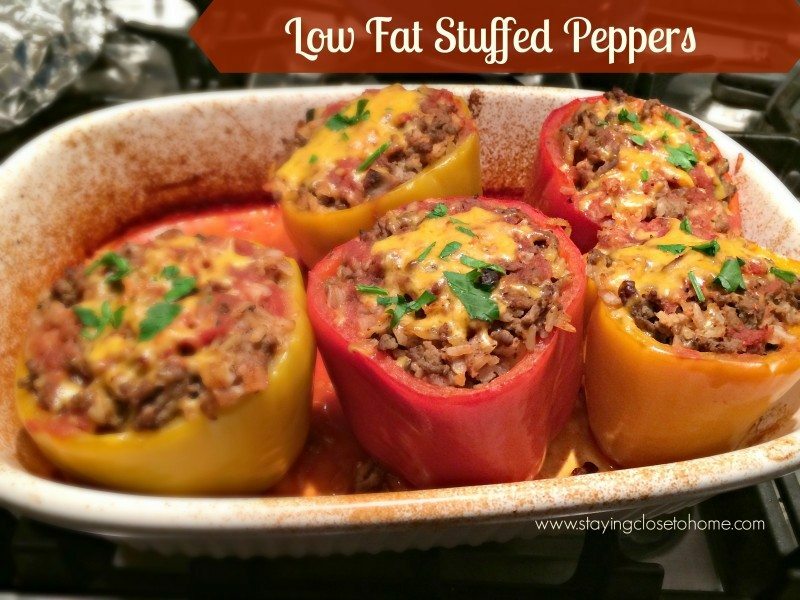 Knowing they prefer colored sweet peppers over the Green I thought I would these low fat stuffed peppers recipe a shot. While Green Peppers are typically cheaper than the orange and red peppers, buying them on sale or in bulk at warehouse clubs can be a big savings. I think I paid about 7 dollars for 6 peppers. I also purchased some ground turkey there which is always a savings compared to the grocery store non-sale price. SO far this fits the budget friendly recipes. 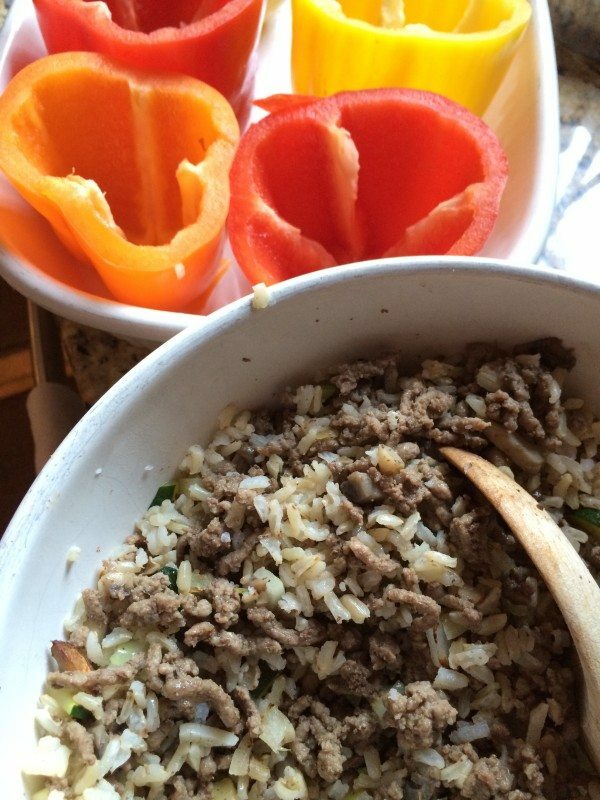 Check out this other great Sweet Pepper Stir Fry recipe. 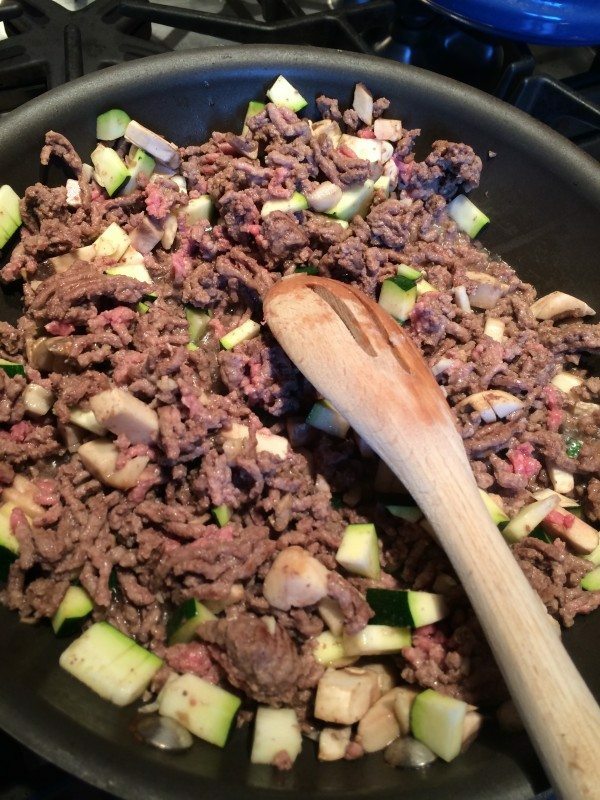 Since I cook more with ground turkey than ground meat this recipe is slightly lower in fat than the traditional stuffed peppers recipes. With only 10 simple ingredients, this is an easy weeknight meal that wont break your budget or waistline. 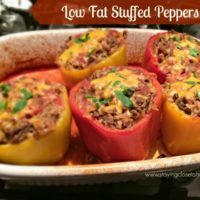 I also added a few veggies that I had in my fridge, it is a great way to disguise veggies plus adds more bulk to the mixture so you can fill more peppers, another great budget friendly recipes tip. I made the stuffed peppers during the day and just covered them until I was ready to cook them. (take them out to reach room temperature while the oven heats up) You can also make the rice the night before if you plan on assembling the entire dish that evening. Since they do take over an hour to bake, you must plan ahead. See you can not even tell I added extra veggies into this. Ready for the oven, now I can go get something else done while this bakes for an hour. Check out the other great Make Ahead recipes we have made. Place in a deep baking dish. Bake in a 350 degree oven for 60 mins, covered with aluminum foil or I like to use pan lining paper so parchment is touching food. Remove foil and bake for 5 more mins. Allow to sit 5-10 mins before serving. What is your favorite Budget Friendly Recipes? Check out the other great budget friendly recipes from the other 14 bloggers. I love stuffed peppers. Thank you for the recipe! 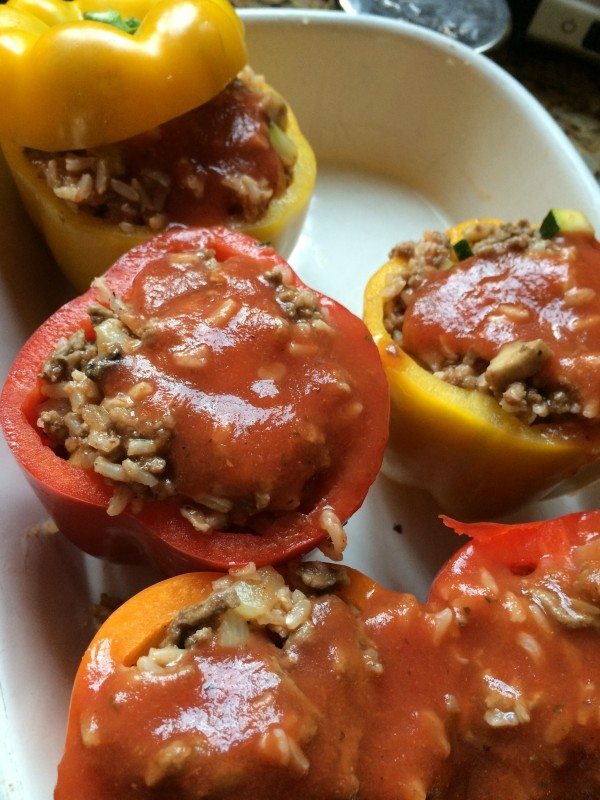 We love making stuffed peppers, and I love your twist on them! Thanks for joining the link up, it’s a great list! My daughter loves stuffed peppers. I like how you incorporated zucchini and mushrooms in yours. Yum – that looks good!! I’ll have to try it once peppers go on sale up here in the mountains. I am always looking for new budget friendly recipes & all of these look delicious! I’m pinning this so I don’t lose it. Could not resist all the colored sweet peppers at the store and they were only $1 each which is a bargain. Oh sorry about your belly let me know how it tastes with tomatoes. THanks for pinning these, they are some good ones. I am so desperate for spring and could not resist the colored peppers. 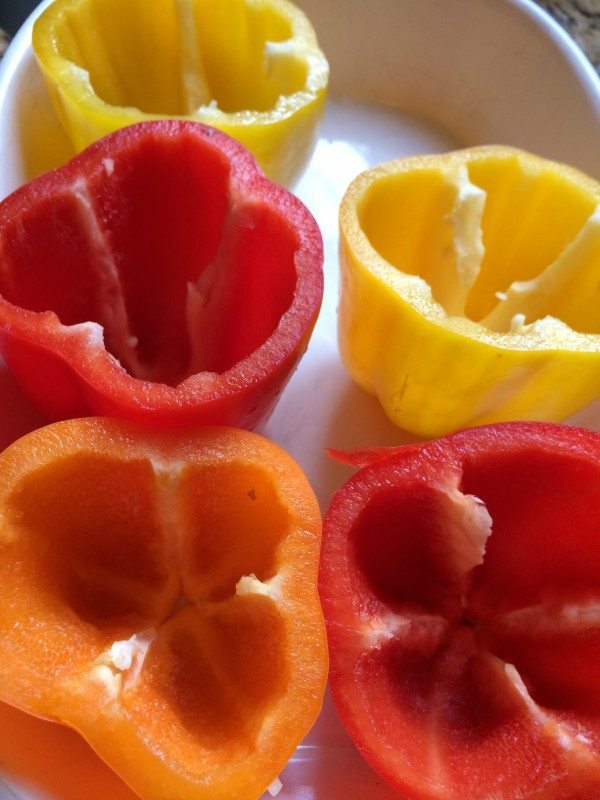 I love all the different colored peppers and the fact that these are not just budget friendly but quick and easy to make. Pinning them to my Budget Friendly Meals board. I can’t eat peppers because my stomach doesn’t agree with them, but I think I will try this recipe with tomatoes. 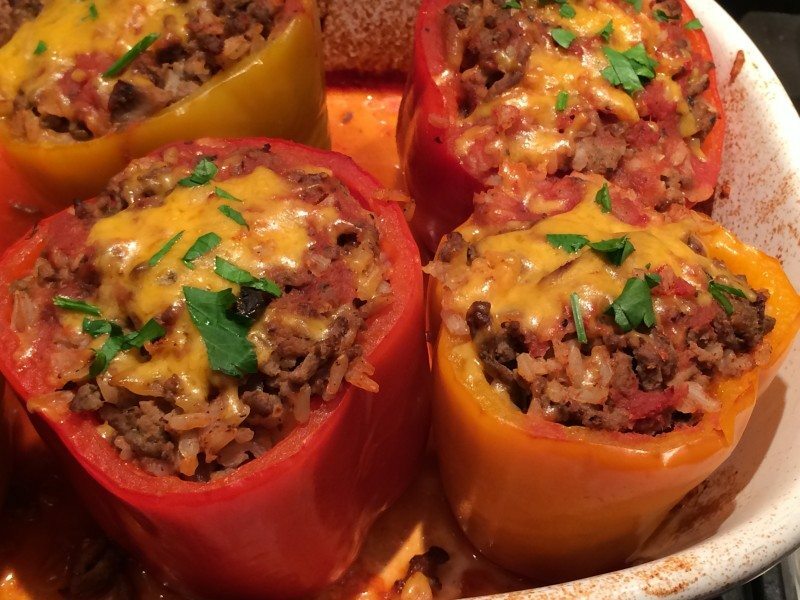 I’ve never seen or thought of using different colored peppers to make this type of recipe. My Mom always used green peppers. I like the color! these look delicious and I love that they are low fat.